Bought out by the Philadelphia Flyers, Ilya Bryzgalov seeks redemption with the Minnesota Wild. Despite being among the NHL’s lowest-scoring teams, the Wild clinched a playoff berth. Sniping winger Jason Pominville led the Wild with 60 points – 30 goals – in 82 games this season. Mikko Koivu – an excellent play-maker and very underrated center – amassed 43 assists and 54 points in 65 games while winger Zach Parise notched 56 points in 67 games (29 goals and 245 shots). Addressing a need for offense, the Wild acquired winger Matt Moulson from the Buffalo Sabres – who was earlier acquired from the New York Islanders – at the trade deadline. Moulson had 13 points in his 20 games with the Wild, but was a three-time 30-goal scorer with the Islanders. Mikael Granlund – the ninth overall pick of the 2010 NHL entry draft – took a big step forward this season in his offensive contributions with 41 points in 63 games. As a rookie in the lockout-shortened season last year, Granlund registered eight points in 27 games. The swift young playmaker will play a vital role in the Wild’s hopes of upsetting the Avalanche. Defenseman Ryan Suter was excellent yet again, posting 43 points in 82 games while playing fantastic defense. Suter is among the best two-way defensemen in the NHL, if not the best. Goaltending has been the issue for the Wild this season. Josh Harding looked like a Vezina candidate in his 29 games (26 starts) with a record of 18-7-3, 1.65 GAA, .933 SV% and three shutouts. Unfortunately for the Wild, health issues kept Harding out and his NHL career may be in jeopardy. Veteran goaltender Niklas Backstrom was a shell of his former self, posting a 3.02 GAA and .899 SV% this season. Backstrom is also out with an injury, as he had abdominal surgery earlier this season. Darcy Kuemper was solid for the Wild, but is also potentially out with an injury. Kuemper is questionable for game one of the series. Although the Wild show offensive promise on their top two lines, they likely do not have the scoring depth to match the Avalanche. 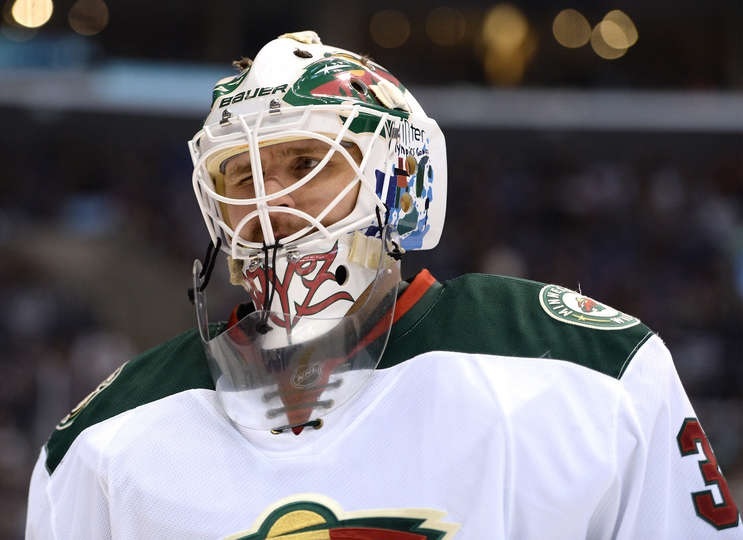 The Wild’s hopes of moving on to the next round rest on the shoulders of goaltender Ilya Bryzgalov. During his time with the Philadelphia Flyers, Bryzgalov was solid in goal but received a lot of criticism from the fans. Although Bryzgalov was indeed abysmal in shootout losses during his time with the Flyers, much of the criticism was unwarranted. The Flyers then bought him out and Bryzgalov has been seeking redemption ever since. Now with the Wild, Bryzgalov may have found redemption. Through his 12 games – 11 starts – with the Wild, Bryzgalov has been superb with a record of 7-1-3, a miniscule 2.12 GAA, .911 SV% and three shutouts (one of which was against the high-scoring Pittsburgh Penguins). After an atrocious 2012-2013 National Hockey League season in which only the Florida Panthers had fewer points than the Colorado Avalanche, the Avalanche made an enormous turnaround and posted the third-best record (52-22-8) in the NHL this season. The Avs’ 112 points trailed only the Anaheim Ducks (116) and the Boston Bruins (117). First-year coach and Hall-of-Fame goaltender Patrick Roy will likely be a shoo-in for the Jack Adams Award. Nathan MacKinnon – the Avs’ number one draft pick – will likely be a finalist for the Calder. The 18-year-old posted 24 goals, 39 assists and 63 points in 82 games. With a Hall-of-Fame goalie as their coach, the Avalanche have been an offensive-minded team. Matt Duchene led the team with 70 points in 71 games this season; however, Duchene is unavailable for the start of the playoffs. Gabriel Landeskog scored 26 goals and 65 points in 81 games for the Avalanche this season and Paul Stastny notched 60 points in 71 games. Also contributing to the offensive youth movement was Ryan O’Reilly, who amassed 64 points in 80 games; O’Reilly also led the NHL in takeaways (83). Defenseman Erik Johnson had his most productive season as a member of the team, matching his career-best 39 points (last achieved in 2009-2010 with the St. Louis Blues). Johnson’s improved defensive play earned the trust of Roy and enabled him to have the necessary ice time to produce offensively. Goaltender Semyon Varlamov had a superb season for the Avalanche, despite the distractions of domestic violence allegations against him early in the season. Varlamov was 41-14-6 with a 2.41 GAA, .927 SV% and two shutouts. Having faced a league-high of 2,013 shots this season, Varlamov saw more rubber than highway roadkill, which makes his .927 SV% all the more impressive. Despite the current absence of Duchene in their lineup, the Avalanche still have young forwards capable of lighting up the scoreboard. If Varlamov continues his stellar play, the Minnesota Wild will be in for a difficult series. Although the Wild likely do not match up offensively with the Avalanche, Bryzgalov’s play will be key in determining whether this is a hard-fought series or a short-lived one. The Avalanche will come out firing the pucks at the net and will gladly trade shot for shot while banking on Varlamov out-dueling Bryzgalov. The two Russian goalies will be the faces of this series.